The Orthodox churches in Wales and the English border counties are to have a pilgrimage to St David’s Cathedral, Pembs on 14 April, St Teilo’s Well, Llandeilo on 9 June and St Winifred’s Well, Holywell on 6 October. Further walks around the Gower churches are planned in the coming months. This course comprises three evenings with Sara and Ruby, aka Seascape Curiosities and Ruby Anne Ceramic Jewellery. Learn a variety of techniques to make your own wearable art, or decorative accessory for your home. All materials will be provided but, if you have any interesting textures (such as lace, leaves, rubber stamps etc.) with which you could impress porcelain, please bring them along, together with an apron. No experience is needed, just come along for three evenings of creative fun! Workshop capacity: Maximum of eight people. Age Restrictions: Suitable for those aged 12 years upwards. Location: Penclawdd Community Centre, Victoria Road, Penclawdd, SA4 3FU. Admission: FREE, but advance booking essential. Peg Loom Weaving with Clarity Hoffman and Mike Smith. Join us for a day of working with wool and a peg loom. Learn how to warp up and weave a small rug that you can take home. You will learn how to wash and dry fleeces, and how to use hand-carders and a drum-carding machine to prepare the fleeces for use. Peg looms and all the materials to make the rug will be provided. Please bring a packed lunch. Tea, coffee and homemade biscuits will be provided. Age Restrictions: Suitable for all ages from seven years upwards. Location: Penmaen Village Hall, Penmaen, SA3 2HH. 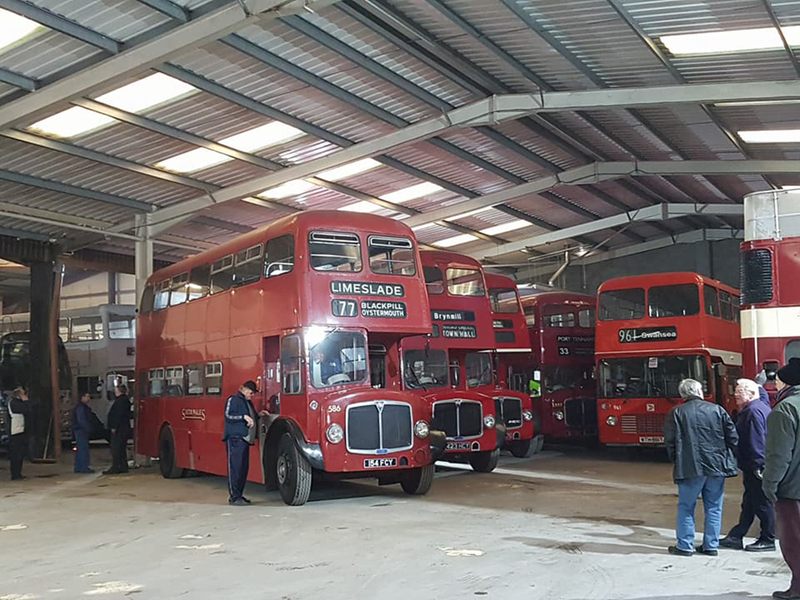 Moving home is not a task to be taken lightly, so spare a thought for the volunteers who were faced with moving an entire bus museum recently. The transport enthusiasts, members of Swansea Bus Museum, had the task when the lease on the building they had occupied alongside Fabian Way ended. Eventually one was located in Viking Way, Winch Wen and after a great deal of effort the museum is not only settling into its new home, but recently celebrated its debut event at the new venue. Museum chairman Alan West said that because of the many complications of moving some of the museum’s collection it was a tribute to its small but dedicated group of supporters that it was achieved within a very tight deadline. The next meeting will be held at Sketty Parish Centre, De La Beche Rd on Wednesday March 28 at 19:30. The April meeting is on Wednesday April 25 at 19:30 at Sketty Parish Hall. Richard Lewis will speak on art in Jacobean and Tudor Wales. A warm welcome is extended to all. All are welcome to join in the Women’s World Day of Prayer at 11am, Tabernacle Church, Newton Rd, Mumbles on Friday March 2nd. Light lunch to follow. The Friends of De La Beche Park are holding an Open Day on Friday 7 April to promote tennis in the area. All are welcome. They will also be a Quiz Evening on Friday 15 June. Both events will be held at the Poppy Lounge at the park in De La Beche Road, Sketty. They say it’s the taking part that counts, but let’s be honest winning can be fun. It must at least account for the beaming smiles on the faces of these gentlemen. 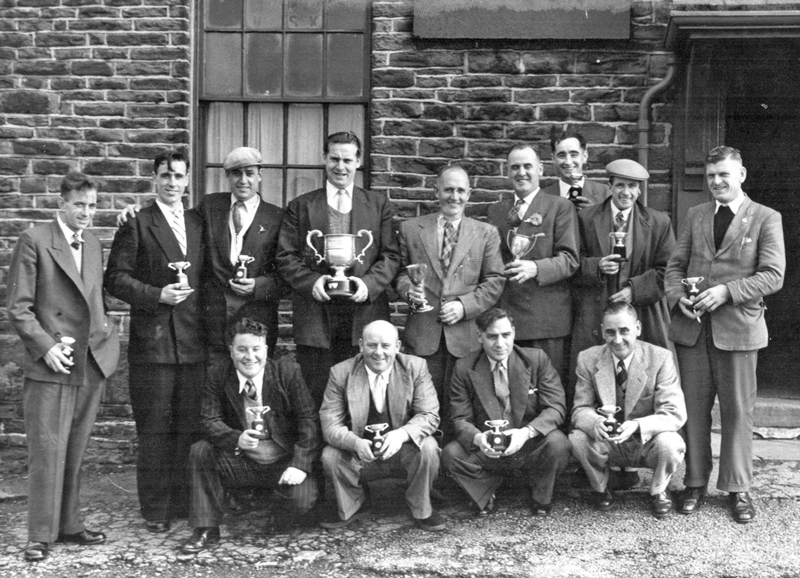 Proudly holding the spoils of success are members of just one of the sports teams that made the Colliers Arms public house in Winch Wen their headquarters in the mid-1950s. The pub is still there, but no doubt many of those in this photograph have sadly passed away. The image is one of more than 300 offered in Swansea Echoes of the past by David Roberts. On sale now, the book captures some fantastic glimpses of Swansea in the past. For details on how to obtain a copy visit www.bryngoldbooks.com or phone 01639 643961. Christian witness on the green in the centre of Mumbles on Good Friday March 30 at 11:00. All are welcome to join together for a short outdoors service. There will be a Big Book Sale at Mumbles Methodist Church behind Theo’s coffee shop from 10:00 to 4:00 from Tuesday April 3 till Saturday April 14. Fun, facts and food with Easter as the theme at Victoria Hall (opposite Mumbles Library) for fam-ilies, from 10:00 till noon on Wednesday April 4. A charity coffee morning in aid of Marie Curie will be held on Saturday, March 10 at Norton Village Hall, Castle Road, Norton (opposite the Beaufort Pub)10.30. Admission £2 includes a drink and a Welsh cake. There will be a classical guitar recital at the Sketty Park Community Centre SA2 8HE (junction of Park Way and Heather Crescent) on Friday 23 March at 19:30. Gary Ryan is one of the world’s leading exponents of the guitar and has performed to international critical acclaim for over twenty years, winning praise for his formidable technique, outstanding musicianship and entertainingly diverse programmes.